I continue the hemipteran theme begun in the last post with this photograph I took in South Africa below the Waterberg Range in Northern (now Limpopo) Province. I recognized them as members of the family Reduviidae (assassin bugs), and since to my knowledge species in this family are exclusively predaceous (except for the so-called “kissing bugs” of the mostly Neotropical subfamily Triatominae, large distinctive bugs that feed exclusively on vertebrate blood), I found what I took to be a case of scavenging on a dead millipede to be rather curious. It had rained the previous evening, resulting in a burst of millipede (and insect) activity that night, and this scene was rather commonly encountered the following morning. Of course, appearances can be deceiving, and it turns out that I actually was witnessing predation – and a most unusual case at that. The individuals in this photo represent Ectrichodia crux (millipede assassin bug), a common species in many parts of southern Africa. Although nearly 500 species of assassin bugs are known from the region (Reavell 2000), E. crux is easily recognizable due to its large size (adults measure up to 22 mm in length), stout form, and coloration – shiny black, with a distinctive black cross incised on its dull yellow thorax and with yellow abdominal margins (Picker et al. 2002). The nymphs as well are distinctive – bright red with black wing pads. Clearly, these insects are advertising something. Ectrichodia crux belongs to the subfamily Ectrichodiinae, noted for their aposematic coloration – often red or yellow and black or metallic blue, and as specialist predators of Diplopoda (Heteropteran Systematics Lab @ UCR). Species in this subfamily are most commonly found in leaf litter, hiding during the day under stones or amongst debris and leaving their shelters at night in search of millipedes (Scholtz and Holm 1985). They are ambush predators that slowly approach their prey before quickly grabbing the millipede and piercing the body with their proboscis, or “beak.” Saliva containing paralytic toxins and cytolytic enzymes is injected into the body of the millipede to subdue the prey and initiate digestion of the body contents, which are then imbibed by the gregariously feeding assassin bugs. Millipedes employ powerful chemical defenses – primarily benzoquinones and sometimes hydrogen cyanide gas as well, which are discharged from specialized glands along the millipede’s body – to protect themselves from predation. Thus, specialized predation of millipedes is a niche that has been exploited by relatively few predators, and little is known about the mechanisms used for circumventing these defenses. The recently reported millipede specialist, Deltochilum valgum (order Coleoptera, family Scarabaeidae), has been observed killing its prey by violently decapitating and disarticulating it before feeding on the body contents (Larsen et al. 2009, summary here); however, the exact manner by which the beetle avoids or withstands the millipede’s chemical discharges remains unknown. For ambush predators such as Ectrichodia crux and other ectrichodiines, a strategy similar to that described for another millipede specialist predator, larvae of the phengodid beetle, Phengodes laticollis (order Coleoptera, family Phengodidae), might be employed. This species subdues its millipede prey by piercing thinner regions of the millipede’s integument (e.g., intersegmental membranes on the ventral surface) with its hollow sickle-shaped mandibles and apparently injecting gastric fluids that abruptly paralyze the millipede, thereby preventing it from discharging its gland contents (Eisner et al. 1998). These undischarged benzoquinones remain confined to the glands and are prevented from diffusing into the body cavity by the glands’ impervious cuticular lining, thus allowing the phengodid larva to safely imbibe the liquified systemic contents of the immobilized millipede. Picker, M., C. Griffiths and A. Weaving. 2002. Field Guide to Insects of South Africa. Struik Publishers, Cape Town, 444 pp. This entry was posted in Diplopoda, Hemiptera, Reduviidae and tagged assassin bugs, bugs, chemical defenses, entomology, immatures, insects, millipedes, nature, predation, predator avoidance, science, South Africa, warning coloration. Bookmark the permalink. Another interesting post. Love it. The insights you provide are marvellous. Seeing the picture first I thought “we have the same one here” until I started reading and found it WAS the same! An interesting post Ted. I have wanted to post mine for ever such a long time now but have not had the chance to look it up, so thanks for telling me. What surprised me about this bug was that he looked like plastic and I almost by-passed him for this reason. Huckleberry – thanks, it was a bit of a learning experience for me, too. It is interesting that there is an adult and three juveniles here. Is that just an accident, or does the parent assassin bug actually care for its young, teaching them to hunt and helping them to catch prey? Tim – Good thought, and I wondered about this myself. I couldn’t find any reference to parental care for this species in particular, but Picker et al. (2002) do mention it for another South African assassin bug. Apparently this has been reported in several other reduviid subfamilies as well. 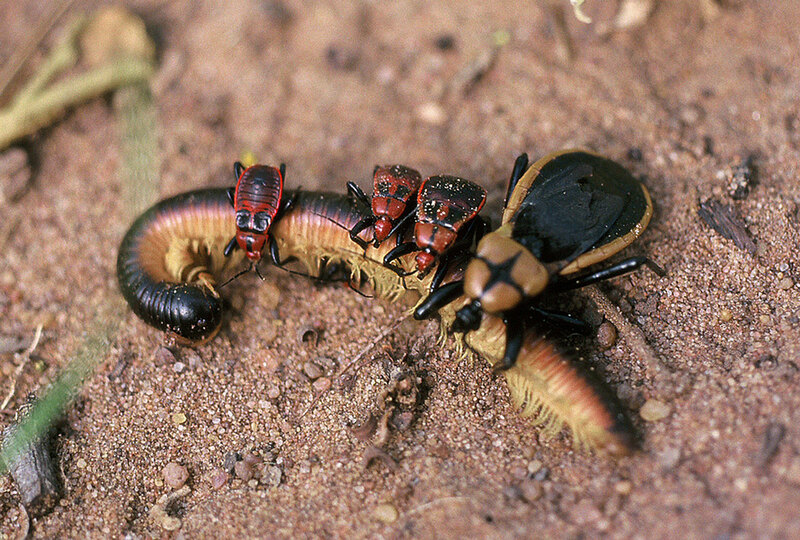 In the subfamily Ectrichodiinae, where prey consists exclusively of millipedes, one would think it might be difficult for an early instar nymph to capture and kill such large prey all by itself. Oh my God! How…perfectly gruesome! Was it Woody Allen who hated nature because it was like being in one big restaurant? Gee whiz, Ted. I spent the day learning about springtails and some diptera that starts with an m…macrod something? Known from a seepy area in a sinkhole at Ha Ha Tonka. You belong to a different world. It must be nice to be so smart. I once kept some Platymeris mombo and watched them group feed on some Manduca sexta. My hand to ceiling cat, they’re exactly like mintiture wolves the way they hunt their prey down and subdue it. Perhaps not as organized, but if there were one thing an entomology nerd should see before they were pinned, I’d say that would be near the top. Hi Ted, Very nice picture and text. In fact, as mentioned by Tim, it is the first time I have seen both adults and nymphs of an Ectrichodiinae feeding together. Parental care is only known in the subfamily Harpactorinae, with a dubious record from one species of Emesinae. More field observations are needed in the case of Ectrichodiinae, so if you found again more of these….cheers! Hi Dimitri–thanks for the additional insight. This single picture is the only evidence I have for parental care in this species. Thanks for the cool picture and very informative descriptions. Very fascinating! Regarding what nymphs could feed on, i think smaller or immature millipedes could be appropriate prey. Certainly, it’s going to be an extremely interesting story if this was a case of parental care. Then, we would see a little troop of ectricodiines marching on the ground in search of millipedes. Also, thanks for citing our webpage! Hi Guanyang – yes, I didn’t think about small millipedes. Certainly a nymphal reduviid could subdue one of those. Of course, if they hang around with their mothers and feed on her prey, then there is no need. I wish I would have tried to document more fully what was going on here – but hey, I was after buprestids! My thanks to you and Dimitri for stopping by and adding your insights. :D…Yes, yes, field observations are awesome at this age of everything being experimental! Look forward to seeing more of cool pix from you! This is a wonderful job Ted.